Pelvic Exercises DVD ‘Inside Out Strength’ is the new pelvic floor strength and whole body workout for women seeking a safe and effective professionally guided exercise routine. Available worldwide, ‘Inside Out Strength’ helps you exercise safely, reduce your risk of pelvic floor injury and strengthen with confidence. Women who desire health professional expertise regarding safe strength exercise prescription and pelvic floor exercise guidance will particularly benefit from exercising with Inside Out Strength. Inside Out Strength combines in depth understanding of pelvic floor physiotherapy along with Michelle’s expertise in the principles of safe and effective strength training for women. 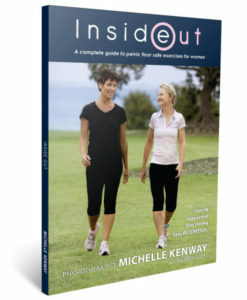 Michelle Kenway is a Pelvic Floor Physiotherapist, exercise instructor for women, presenter and author of the internationally acclaimed book Inside Out – the essential women’s guide to pelvic support. Michelle is recognised worldwide for her expertise in designing and promoting pelvic floor safe exercise for women. Michelle is married and is an active mother of two. Inside Out Strength is copyright protected and the film and soundtrack in this disc is for home use only. All other rights reserved. Any unauthorized copying, editing, exhibition, renting, hiring, lending, public performance, distribution and/or broadcast of this DVD is prohibited.